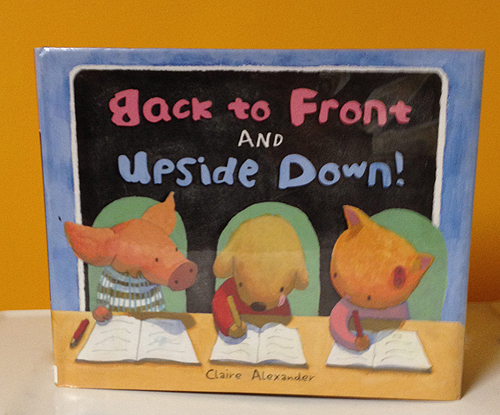 How I Feel About Books: Back to Front and Upside Down! Back to Front and Upside Down! is a picture book about the frustration of learning to write. Stan's class is making birthday cards for the school principal, Mr. Slippers. Stan is excited to draw pictures on the card, but then the teacher says that everyone needs to write "Happy Birthday". Stan has a lot of trouble with writing; some of his letters were backwards, some were upside down, and some didn't even look like letters. Stan's classmates are writing correctly, and he's too intimidated to ask for help. Stan doesn't want to be laughed at. With some encouragement from a friend, Stan learns that it's ok to ask for help. The illustrations in this book are brightly colored, and convey a lot of emotion even though they're not incredibly detailed. Each character is a different animal, so there is potential for talking points when reading this book aloud by asking the child what animal each character is. The font looks like handwriting, which ties the story together nicely since Stan is struggling with his writing! This book never explicitly says it's about dyslexia, and Stan's quick improvement suggests that it is not, but it's still a good book to read to children with learning disabilities. They'll be reassured that other people have similar problems, like Stan and Mimi in the story. It will also show them that it's ok to ask for help, and it's ok if it takes them longer to learn, read, or write things. Overall, it's a great book for any child to show them that you can always ask for help, and to accept others as they are, without laughing at their struggles. Alexander, Claire. Back to Front and Upside Down! Grand Rapids, MI: Eerdmans Books for Young Readers, 2012. Print.